An exhibition and curriculum about a Durham human rights hero! This is your portal for everything you need to teach about our Durham human rights hero Pauli Murray in your classroom. The Pauli Murray Project developed a curriculum for 3rd, 4th, and 8th grade classrooms to accompany the exhibit. It is designed to ignite thinking about students’ own places in history and their skills as readers, writers, and citizens. Curriculum is tied to Common Core and NC Standards and centers on a fieldtrip to the exhibit. 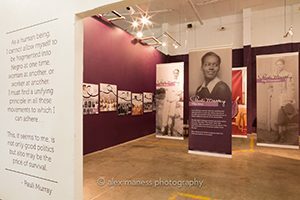 We are taking fieldtrip reservations for the “Pauli Murray: Imp, Crusader, Dude, Priest” exhibit NOW! To schedule a field trip, email paulimurrayfieldtrips@gmail.com or call 919-613-6167. Slots are available from 10 am to 11:30 am Monday through Friday! The field trip is about 2 hours and takes place at The Scrap Exchange on Chapel Hill road in Durham. The exhibit is free with an option of visiting The Scrap Exchange’s Make-N-Take Room, which is $3 for every student. Trained exhibit education coordinators from the Pauli Murray Project will lead students through activities that allow students to have a deep engagement with the exhibit content, practice critical thinking skills, and synthesize information they have learned in the classroom in a different setting. Please see the “Read Me First!” document in the curriculum drop box for more information about the Field Trip. Our goal is to create a framework for students to advance their skills in critical thinking, narrative writing, creative expression, and to gain a greater awareness of a local hero, Pauli Murray, and her fight for human rights across different historical contexts. We hope students will walk away from each activity with insights about the how history, politics, and identity connect and a view of themselves as active citizens in their own communities. The theme for grades 3rd and 4th is How do words and images shape our world? The theme for the 8th grade is Telling and documenting our stories as activism. We chose 3rd, 4th, and 8th grades because of the natural link to Durham and North Carolina history units but the curriculum can be adapted for any grade level. The Rev. 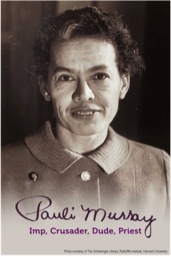 Dr. Pauli Murray, 1910-1985, was an accomplished American activist who believed in justice, reconciliation, and freedom. She championed the cause of human rights through her work as an author, educator, lawyer, feminist, poet and priest. Pauli Murray grew up in Southwest Central Durham at 906 Carroll Street. She graduated from Hillside High School in 1926. Pauli Murray is a local hero that students can connect with because of her ties to Durham and her drive to stand up for everyone’s right to be themselves. 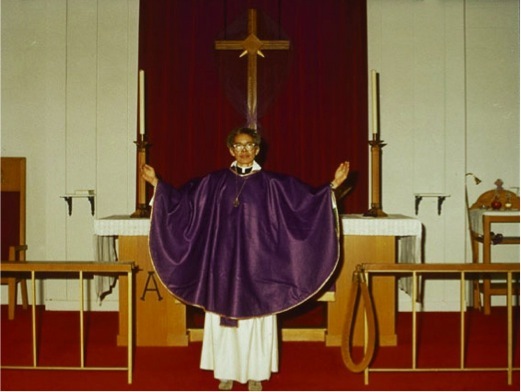 Priest Image- “Pauli Murray in vestments at St. Ambrose Church in Raleigh, NC, 1978. In July 2012 the Episcopal Church voted to add the Rev. Dr. Pauli Murray to their Book of Holy Women, Holy Men: A Celebration of Saints, to honor her life and work as a model for all. Exhibit view-View of “Pauli Murray: Imp, Crusader, Dude Priest” Exhibit by Alex Maness.